I just received the new Kaktusy Special monograph on Lophophora. It comprehensively describes the distribution, characteristics and classification of the genus. 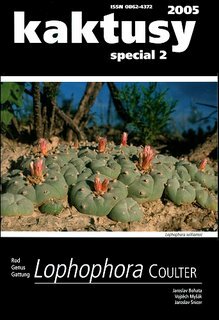 In an attempt to resolve some of the taxonomic confusion surrounding Lophophora the authors propose a division of the genus into two sections and a change of rank. 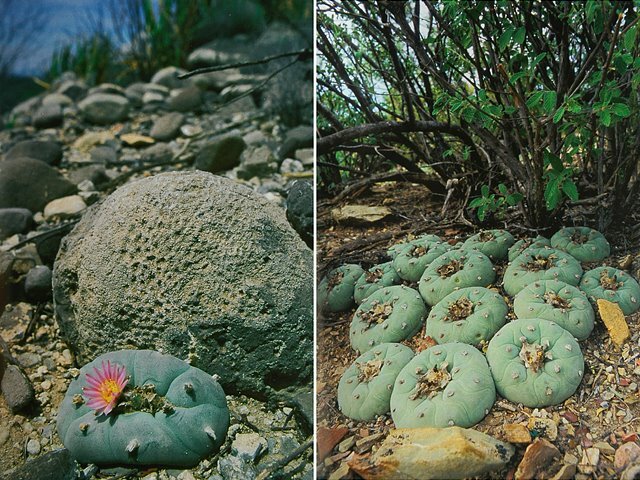 Based on factors like chemical composition, habitats, incompatibility of the species, rib numbers and morphology, etc, a division of the genus into the two sections Lophophora and Diffusae is proposed. Section Lophophora comprises the various forms of the species L. williamsii including the type species (hence the autonym for the section). Section Diffusae includes the three species related to L. diffusa, i.e. L. diffusa itself, L. fricii, and L. koehresii (aka L. diffusa v. koehresii, aka L. viridescens). The authors argue convincingly for the taxonomic revision but it would have been interesting if the revision was supported by DNA sequencing results (like Butterworth et al. who confirmed that L. diffusa and L. williamsii are indeed distinct species). The description for each species includes a detailed distribution map showing the range of the species. The booklet is packed with excellent habitat photos showing the plants natural growth forms (actually some of the very best habitat photos I’ve seen are included in this work – see examples below). 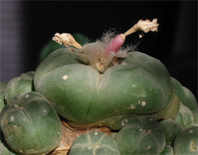 The booklet is rounded of with a few notes on the cultivation of Lophophora. The genus Lophophora is a comprehensive and long needed review of the genus. As mentioned it would have been great with DNA sequencing results supporting the change of rank for L. fricii and L. koehresii. Also an index and a list of literature references would have been helpful. That being said, The genus Lophophora must be recommended to anyone interested in these fascinating plants. The booklet is written by Jaroslav Bohata, Vojtĕch Myšák, and Jaroslav Šnicer; it comprises 48 pages, contains 89 color photos, 3 black and white photos, and 6 drawings. It is available from the Society of Czech and Slovak Cactus and Succulent Growers. Apart from the English edition I believe German and Czech editions are published as well. I bought the booklet based on your recommendations and I’m very pleased that I did. The pictures are super and the info great. But I was very disappointment in the lack of a bibliography (i.e. list of literature references). Also the lack of DNA sequencing, as you said, lessens the credibility on a scientific level. But all in all a must have for every Lophophora enthusiast. By any chance, do you think you can send me, or post, the Lophophora willimasii distribution map from this publication? It would be interesting to compare distribution maps available. Anderson's 1980 map is extremely out of date. I would really appreciate a current map, as I am having a hard time finding one. Sure. I'm currently in London on business but will mail you a copy when I'm back home (in a couple of days). My scanner is broken so I'll have to photograph the map - hope that will suffice. I can't remember if the map is based entirely on current data or if it's extrapolated from Anderson's work.